In the last few days, I made the decision to cut out all refined sugars from my diet for a while and re-assess after a period. Of course any time a common ingredient is cut from ones diet, everything turns to shambles – what the %^&* am I going to eat now? The fact that I even asked myself that question strongly suggests that maybe I do eat too much refined sugar. The problem with this is that we recently started having slow cooked lamb with mint sauce once a week. I got a nice lamb leg from the butcher. So seemingly, I am set to go for my roast lamb with mint sauce dinner right? No! I check the mint sauce and the mint gel in my pantry and it is all loaded with at least a couple of teaspoons of added sugar each serve. I panick. What am I going to have on my lamb? I fantasize about mint sauce. So this totally put a huge spanner in the works. Store brought mint sauce is a sugar fest and I don’t think it needs to be. A short trip up the road later, and I got myself a bunch of fresh mint. 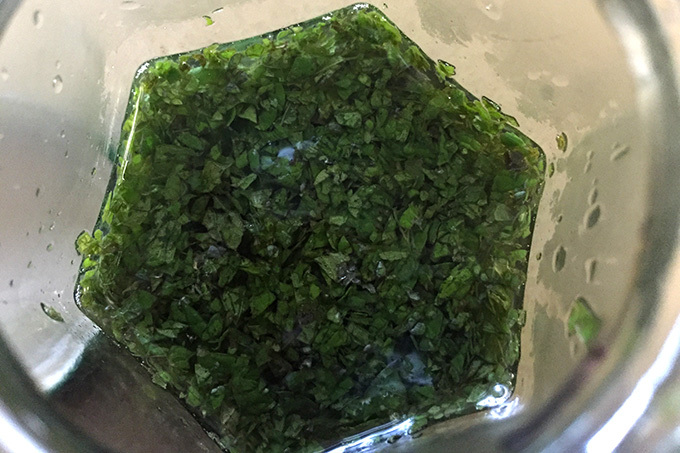 The goal: to make a very quick simple natural delicious mint sauce. The result is perfect – love it. I will admit I did experiment with different vinegars first. Much as I adore apple cider vinegar, the white vinegar just worked so much better with bringing out the pure clean flavor of the mint. This recipe makes half a cup of natural mint sauce and because it has no sugar and only goodness, you can have as much as you like without any guilt – in fact, the more the better. Personally, I just wanted to drink it (okay so I drank a tablespoon) – love that mint flavor. It makes me feel kind of zippy and uplifted. Looking forward to having this slathered over my lamb tonight. Stir and place into an air tight jar in fridge until serving time. This is fantastic with roast or slow cooked lamb. How long will this safely keep? As it is so quick and easy to make, I always make it fresh and use it on the day, as the flavor is best fresh.